"A good cornbread muffin that can be frozen in bags and reheated as needed." Preheat oven to 450 degrees F (230 degrees C). Lightly grease or line 12 muffin cups. In a large bowl, mix together cornmeal, all-purpose flour, baking powder, baking soda, salt and sugar. In a separate bowl, combine buttermilk, eggs and vegetable oil; beat well. Pour buttermilk mixture into flour mixture; stir until blended. Pour batter into prepared muffin cups. Bake in preheated oven for 15 minutes, or until a toothpick inserted into the center of a muffin comes out clean. This was the best cornbread ever. I replaced the sugar with a 1/2 cup honey and cooked in a 9" greased and floured cake pan until a toothpick came out clean. Really, this was very good! 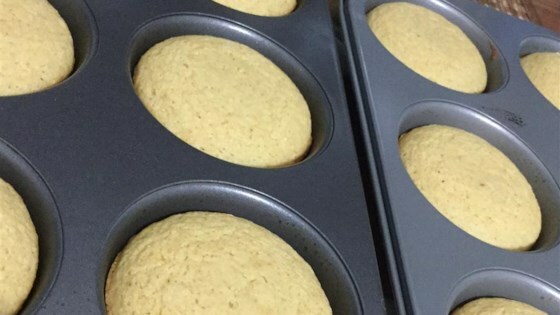 This is one of the best corn muffin recipes that I have tried. It is not dry and both my daughter and son-in-law really enjoyed these corn muffins. Great cornbread! Very easy! We liked them so much that I made them twice in one day.